NOTE: This is the second installment in a three-part series on earning and maintaining a reader’s trust. The previous installment focuses on earning initial trust just at the start of a story, while this part focuses on how world-building, consequential plotting, and story structure/pacing affect the reader’s trust. The third and final installment dealing with character consistency/reliability will be was published on Tuesday, December 6th, 2011. Getting the reader to turn past page one is only the start of the battle. Once we’ve got the reader reading along with us, the next step is to make sure that they stay engaged and gradually become more immersed in our fictional world. I think this rests on the concept of accessibility, and in speculative fiction that accessibility relates very closely to world-building. When we read, we store all of the salient facts about the fictional world in our brains. We need them to put the story in context: they color how we imagine events unfolding, and they ensure that we understand what it means for the Dothraki to invade Westeros. Cramming all of that information into the reader’s head decreases the book’s accessibility, risks wearing the reader out, and gradually degrades the reader’s trust in the author’s skill. Which is why I believe that accessibility is a key virtue of maintaining reader trust: if the world-building, characterization, and plotting is presented in an accessible fashion at a rate that the reader can internalize without drowning in detail or florid prose (*cough* Umberto Eco), then the reader is far more likely to trust the author enough to keep reading. Nevertheless, world-building and detail remain an intrinsic component of all fiction. Our job as writers is to strike an appropriate balance between our world-building and our story’s accessibility. If we throw in too much world-building, the detail might occlude the story (the literary equivalent of hiding a forest behind too many trees). On the other hand, if we withhold too many details then our story loses clarity. Both mistakes can lose the reader’s trust, which is why a balance must be struck between them. We don’t read books for the setting, or for the characters, or for conflict. We read books for the underlying story, which we access through the characters, conflict, and setting. Just about any story can be told in a different environment or with completely different characters, and to maintain reader trust, we need to make sure that the details we offer don’t obscure the story that underlies them. The more details we load into the text, and the rate at which we pack those details into our paragraphs, the harder it will be spot the underlying story. But some detail is always needed, whether we’re writing a secondary world fantasy or a contemporary mainstream realistic novel. As Charlie Stross points out in this excellent essay on world-building, every piece of fiction relies on a balance between what the author shows/tells the reader, and the reader’s shared experience of the world. If we’re writing a realistic piece of contemporary fiction set in New York City, our readers will open the book with preconceived ideas and experiences of what NYC is like. Even if they’ve never set foot in Manhattan and unless they’ve been living in a cave, they will have certain images and concepts taken (accurately or not) from movies, other books, and their own cultural background. If we’re writing a piece of contemporary realist fiction, we can rely on their shared experiences and thus skimp (to some extent) on the details. We don’t need to define, explain, or depict a car or a traffic light for the reader to understand what’s going on. Since we can eschew detailed explanations, we can instead focus on how those objects act or are acted upon within our story. This shared experience establishes a certain baseline for reader trust. It is when our story diverges from the reader’s expectations (when we put the island of Manhattan on the Yangtze River, for example) that we risk that trust. Diverging from shared experiences makes it incumbent upon us to offer some sort of explanation for the new or unusual elements. It takes groundwork on our part to prepare the reader for that type of cognitive estrangement. This groundwork happens at many levels within the story, and it actually starts with the book’s marketing category and design. For example, the cover of Eric Flint’s 1632 immediately tells the reader that they’ll be dealing with some type of anachronistic story where armored knights on horseback encounter modern pick-up trucks. If the reader is expecting a completely realistic story, they know just from the cover to look elsewhere. Unfortunately, we can’t rely on design and marketing category to do the heavy lifting for us (for one thing, traditionally published authors rarely have any control over either). The details we include in our text, the way we talk about our characters’ assumptions, the descriptions we offer of our setting, the words our characters use are the hammers, screws, and nails of our world-building. Consider what an innocent verb like “steamroll” implies about a world. Sure, it’s tempting in our contemporary context to describe an overbearing character as a “steamroller” or to say that character X “steamrolled” character Y. But if our story is set in a pre-industrial world, then “steamrollers” or even steam-rolling mechanisms for clothing likely wouldn’t (yet) exist. It is this kind of minor, precise detail of world-building which risks undermining a reader’s trust in the author and our world-building. I suspect there are as many techniques for effective world-building as there are books. Regardless of what technique we apply, it is the consistency of that world-building which maintains the reader’s trust. In the previous installment, I quoted from the opening of Patricia C. Wrede’s Dealing with Dragons . Her first paragraph establishes that we are dealing with a secondary world (the fictional land of Linderwall, east of the fictional Mountains of Morning), that is quasi-medieval in nature (a feudal system with kings, queens, princes/ses, and knights), and magical (dragons and fairy godmothers included). This single paragraph establishes the entire context necessary for the rest of Wrede’s world to be imagined and understood. Were Wrede to introduce a new element into her story (witches, for example), it has to fit within that context. If her new element does not fit (e.g. airplanes), then without expanding the context to make it believable, it would create a dissonance that damaged the reader’s trust. Because Wrede does an excellent job of concisely contextualizing the story’s environment in her first paragraph, she levels up and earns the ability to quickly introduce new elements into her world’s context. So long as she maintains consistency with that brief initial context, we won’t even blink at the introduction of characters transformed by witchcraft, or of magical forests. We are able to internalize them as rapidly as the author serves them up because of that consistency. However, consistency does not give us carte blanche to infodump detail on our poor unsuspecting reader. Ultimately, it is the story that should determine the rate at which new details are introduced. In Dealing with Dragons , Wrede could have theoretically taken ten pages and written a description of her world’s geography, its politics, and the systems of magic that operate within it. But doing so would have halted the forward momentum of the underlying story, and given the reader too many details (however consistent they might be) to maintain the story’s accessibility. Story is key, and no amount of world-building detail should ever obscure it. When I think about this in my own writing, I think of it in terms of Hemingway’s iceberg theory: sometimes by consciously leaving details out of our text, we actually make both the world-building and the story more accessible. As the creators of our worlds, we should know everything there is to know about them. Their historical background, their cultural environment, technology, idiosyncrasies, etc. In our heads, we should have a veritable encyclopedia of knowledge about our made up world. But that doesn’t mean the reader needs it. 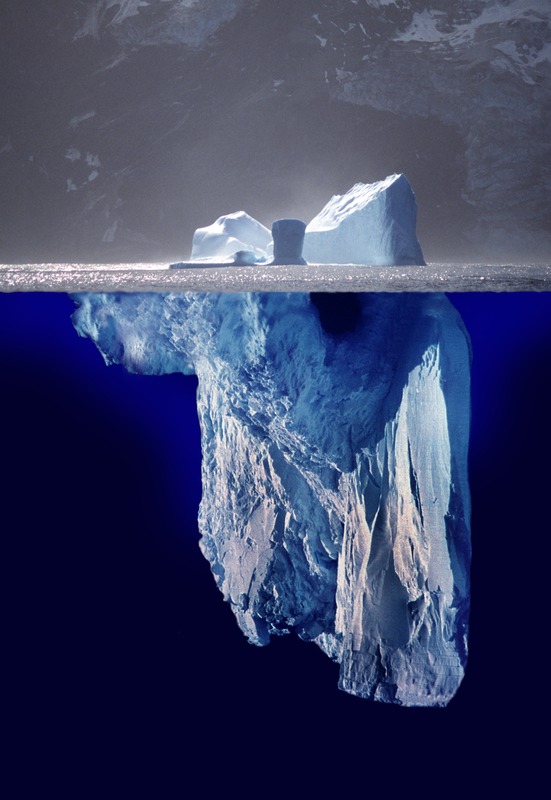 An Iceberg in Profile, via Wikimedia. Created by Uwe Kils (iceberg) and User:Wiska Bodo (sky). If we’ve done our homework, and if we’ve fully imagined our world, then even if we don’t explicitly include details in our text we will still write consistently within our context. That’s because all of that detail – from the shoes our character might be wearing, all the way to their fraught childhood relationships with neighbors – sits in the back of our brain and trickles through onto the page. The reader doesn’t need to see that, because it becomes the underlying detail that exists between the lines on the page. It’s what Hemingway called the iceberg effect, where only the top 10% of the story is actually shown to the reader. The rest remains in the author’s head. Even if we never show the reader those details, readers will still have the palpable sense that the details exist somewhere: that the author knows what they are doing, and that they will include only the necessary details in the text. This ties into the concept of including details as demanded to by the story. If, lacking a particular detail, the story won’t move forward, then by all means include what’s necessary. If your character needs to leave on a space ship, you’ll need to introduce the minor detail of the space ship itself. But if you only include the information the story needs, and you make sure that information is consistent with a more generally established context, then I think you’ll go a long way to maintaining reader trust. Our job is to give the reader the details they need to understand what happens, and enough context to imagine the rest. So long as our world has some logical underpinnings, and so long as we consistently depict the extrapolations of our world, the reader will have confidence that we know what we’re doing. At least, that’s my hope. Just as a balance must be struck between world-building and the story’s accessibility, there exists a similar balance between story structure and its accessibility. Fiction is wonderful in that we can play many fun games with non-linear stories, jumps in time, jumps in perspective, etc. Our range of motion and range of structures are arguably limitless. But the more complicated we make our story structure, the more mental gymnastics our readers will have to perform to follow along. Sometimes, we want a complex structure. Italo Calvino’s If On a Winter’s Night a Traveler is multiply-recursive, extremely meta, and is half told in second person. It is a complicated puzzle-box of a novel. However, it remains a delightful (if challenging) book to read. Justine Larbalestier’s Liar jumps backwards and forwards in time, and wrestles with an unreliable narrator who at several points recants most of the preceding story. It too has a complicated structure, and challenges the reader to understand what is actually happening. Both Calvino and Larbalestier employed complex structures because those structures helped accentuate the themes they wished to explore. They faced a trade-off between the degree of complexity (decreasing the story’s accessibility and risking reader trust) and the efficacy of their thematic goals. When it comes to story structure, I suspect the trade-offs are more numerous than that. Generally, I fall into the school of thought that says story structures should be simple unless their complication is thematically driven. But I know many others successfully complicate their structures for more tactical reasons: managing suspense, pacing, or side-plot resolution. When working on story structure, I think every decision to complicate that structure needs to be carefully considered. If it detracts from the story’s accessibility, it should at the very least maintain the story’s forward momentum. Decreasing the story’s accessibility will gradually erode the reader’s trust, but losing that forward momentum is a much faster way of losing that trust. After all, they’re reading the story for the story. If your structure stops the story’s progress, then the reader is no longer getting what they’re looking for. And what readers want is a sequence of events where each event follows in some logical fashion from the events and choices that preceded it. The very concept of story is predicated on events and choices having consequences. A description of unrelated events does not constitute a story: it is just a recitation of unrelated facts. When readers begin reading our story, they are investing effort to internalize our world and follow our structure because they want to see what happens. They make this effort because, if we’ve done our job right, they trust that we are giving them the salient facts and details which they need to maximize their enjoyment. If what they read on the first page has no bearing to what they read on the last page, then as writers we have betrayed that trust, and the reader is right to feel cheated. This is why deus ex machina is so often deplored. It implies that everything the reader worked to get through is meaningless for the story’s conclusion. It makes the story a trick, misdirection, sleight of hand. If such misdirection is part of the book’s thematic purpose (as with Larbalestier’s Liar , for example) then groundwork needs to be laid throughout the story that makes it plausible within the story’s context. It’s the equivalent of setting up the prestige in a magic trick: all of the work that makes the trick functional happens before the trick itself. In the movie Serenity , Joss Whedon killed off one of the series’ beloved characters to make an existential philosophical point. Many fans – myself included – felt betrayed by this event, because there was no groundwork within either the movie or the preceding television series to prepare the audience for it. Of course, Whedon’s point was that death can strike at any time and especially in situations of high danger. But at no point prior to this did he lay any groundwork for this thematic and tonal point. As a result, the atonal dissonance of the event struck many fans as an effect without a prior cause. This weakened (and in some cases broke) many viewers’ trust. Compare this to the way that George R.R. Martin deals with the death of beloved characters in his Song of Ice and Fire series. At the end of Game of Thrones (the first book in the series), one of the principle characters gets killed. But unlike Whedon, Martin carefully laid the groundwork throughout the preceding pages for this event to be plausible within the context of his story. He put in the work to make the death consistent on a tonal, thematic, characterization, and plot level. Early in the book, one of Martin’s other characters – a young child – gets chucked out of a window by two other principle characters. If nothing else, chucking that kid out of the window established that this was a story where horrible acts occur to undeserving people. As the plot unfolded, Martin carefully made sure that his characters were put in varying degrees of real, consequential danger and discomfort. He balanced the motivations on all sides of the conflict. This stands in stark contrast to Whedon’s out-of-left-field “hand of Author as a Capricious God” moment in Serenity . It is this consistency and consequence of story, plot, and character which maintains the implied contract between the reader and the author. And that consistency is equally important when dealing with the characters and narrators who tell the story, regardless of how reliable they may be. NEXT: Come back on Tuesday for Check out the third and final installment on how character consistency and reliability contribute to managing reader trust. >Many fans – myself included – felt betrayed by this event, because there was no groundwork within either the movie or the preceding television series to prepare the audience for it. And after that scene in the movie, I’ll never forget how the fangirls in the back of the theater screamed when Simon got shot. Joss had told them the gloves were off, after all. If Firefly didn’t exist, I probably would have no problem with the death scene at all. But because Serenity consciously built upon the tone and thematic content of Firefly, with a sizable investment in time, and story content, the little thematic and tonal groundwork that the movie provided was not enough to offset the prevailing context. If Serenity were a standalone story, without the prior show? I’d probably say it was fine. But by the point Serenity hit the screens, there was an awful lot of thematic and tonal momentum already built up. Moving a ship of that size with that much momentum takes more effort than was spent.